For the French wine grape, see Mondeuse noire. Guyenne or Guienne (French: [ɡɥijɛn] ; Occitan : Guiana [ˈɡjanɔ] ) was an old French province which corresponded roughly to the Roman province of Aquitania Secunda and the archdiocese of Bordeaux. The Kingdom of France was organized into provinces until March 4, 1790, when the establishment of the department system superseded provinces. The provinces of France were roughly equivalent to the historic counties of England. 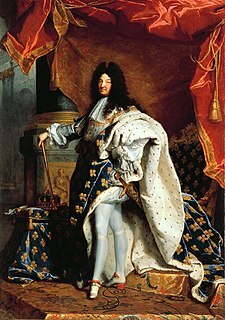 They came into their final form over the course of many hundreds of years, as many dozens of semi-independent fiefs and former independent countries came to be incorporated into the French royal domain. Because of the haphazard manner in which the provinces evolved, each had its own sets of feudal traditions, laws, taxation systems, courts, etc., and the system represented an impediment to effective administration of the entire country from Paris. 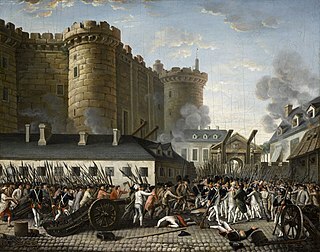 During the early years of the French Revolution, in an attempt to centralize the administration of the whole country, and to remove the influence of the French nobility over the country, the entirety of the province system was abolished and replaced by the system of departments in use today. 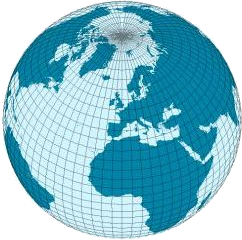 The name "Guyenne" comes from Aguyenne, a popular transformation of Aquitania. 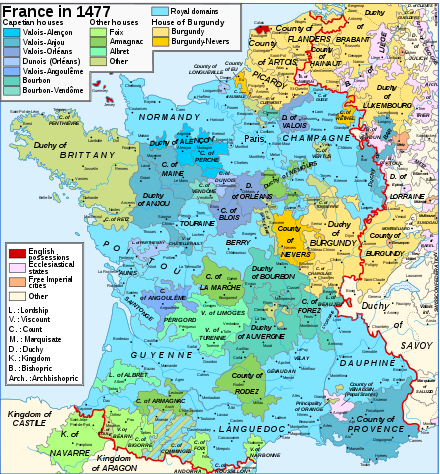 In the 12th century it formed, along with Gascony, the duchy of Aquitaine, which passed under the dominion of the kings of England by the marriage of Eleanor of Aquitaine to Henry II. In the 13th century, through the conquests of Philip II, Louis VIII and Louis IX, it was confined within the narrower limits fixed by the treaty of Paris (1259). It was at this point that Guyenne became distinct from Aquitaine. It then comprised the Bordelais (the old countship of Bordeaux), the Bazadais, part of Périgord, Limousin, Quercy and Rouergue and the Agenais ceded by Philip III to Edward I in 1279. Still united with Gascony, it formed a duchy extending from the Charentes to the Pyrenees. This duchy was held as a fief on the terms of homage to the French kings and both, in 1296 and 1324, it was confiscated by the kings of France on the ground that there had been a failure in the feudal duties. The Duchy of Gascony or Duchy of Vasconia was a duchy in present southwestern France and northeastern Spain, part corresponding to the modern region of Gascony after 824. The Duchy of Gascony, then known as Wasconia, was originally a Frankish march formed to hold sway over the Basques (Vascones). However, the Duchy went through different periods, from its early years with its distinctively Basque element to the merger in personal union with the Duchy of Aquitaine to the later period as a dependency of the Plantagenet kings of England. Eleanor of Aquitaine was queen consort of France (1137–1152) and England (1154–1189) and duchess of Aquitaine in her own right (1137–1204). As a member of the Ramnulfids rulers in southwestern France, she was one of the wealthiest and most powerful women in western Europe during the High Middle Ages. She was patron of literary figures such as Wace, Benoît de Sainte-Maure, and Bernart de Ventadorn. She led armies several times in her life and was a leader of the Second Crusade. At the treaty of Brétigny (1360), King Edward III of England acquired the full sovereignty of the duchy of Guyenne, together with Aunis, Saintonge, Angoumois and Poitou. The victories of Bertrand du Guesclin and Gaston III, Count of Foix, restored the duchy soon after to its 13th-century limits. In 1451, it was conquered and finally united to the French crown by Charles VII. In 1469, Louis XI gave it in exchange for Champagne and Brie to his brother Charles, Duke of Berry (1446–1472), after whose death in 1472, it was again united to the royal dominion. Aunis is a historical province of France, situated in the north-west of the department of Charente-Maritime. Its historic capital is La Rochelle, which took over from Castrum Allionis (Châtelaillon) the historic capital which gives its name to the province. Gironde is a department in the Nouvelle-Aquitaine region of southwest France. It is named after the Gironde estuary, a major waterway. The Bordeaux wine region is in the Gironde. Tarn-et-Garonne is a department in the southwest of France. It is traversed by the Rivers Tarn and Garonne, from which it takes its name. This area was originally part of the former provinces of Quercy and Languedoc. The department was created in 1808 by Napoléon Bonaparte, with territory being taken from the departments of Lot, Haute-Garonne, Lot-et-Garonne, Gers and Aveyron. The department is mostly rural with fertile agricultural land in the broad river valley, but there are hilly areas to the south, east and north. The departmental prefecture is Montauban, and some of the other large communes include Castelsarrasin, Molières, Caussade, Valence-d'Agen and the medieval town of Lauzerte. The county of Armagnac, situated between the Adour and Garonne rivers in the lower foothills of the Pyrenées, is a historic county of the Duchy of Gascony, established in 601 in Aquitaine. It is a region in southwestern France that includes parts of the Departments of Gers, Landes, and Lot-et-Garonne. The Treaty of Paris was a treaty between Louis IX of France and Henry III of England, agreed to on 4 December 1259, ending 100 years of conflicts between the Capetian and Plantagenet dynasties. Agenais, or Agenois, was an ancient region that became a county of France, south of Périgord. Bigorre is a region in southwest France, historically an independent county and later a French province, located in the upper watershed of the Adour, on the northern slopes of the Pyrenees, part of the larger region known as Gascony. Today Bigorre comprises the centre and west of the département of Hautes-Pyrénées, with two small exclaves in the neighbouring Pyrénées Atlantiques. Its inhabitants are called Bigourdans. Charles, Duke of Berry, later Duke of Normandy and Duke of Aquitaine, was a son of Charles VII, King of France. He spent most of his life in conflict with his elder brother, King Louis XI. The County of Vasconia Citerior was a medieval domain attested as of 824. It may have comprised the lands between the western Pyrenees and the river Adour. The Viscounty, later Principality, of Béarn was a medieval lordship in the far south of France, part of the Duchy of Gascony from the late ninth century. In 1347 the viscount refused to acknowledge the suzerainty of the French king and declared Béarn an independent principality. It later entered a personal union with the Kingdom of Navarre in 1479 and with France in 1589. In 1620 the prince formally incorporated Béarn as a province of France. The Château de Langoiran is located in the district of Bordeaux in Gironde, in Langoiran, Aquitaine, France. The "donjon" of the castle is one of the largest in France. It overlooks the Garonne Valley and offers a good view for visitors. It has been listed as a French Monument Historique since May 1892. Occitanie or Occitania is an administrative region of France that was created on January 1, 2016 from the former French regions of Languedoc-Roussillon and Midi-Pyrénées. France's Conseil d'État approved Occitanie as the new name of the region on September 28, 2016, coming into effect on September 30, 2016. ↑ Xavier de Planhol, An Historical Geography of France (Cambridge, 1994), p. 168. ↑ This article incorporates text from a publication now in the public domain : Chisholm, Hugh, ed. (1911). "Guienne" . Encyclopædia Britannica . 12 (11th ed.). Cambridge University Press. Pépin, Guilhem (2006). "Les cris de guerre « Guyenne ! » et « Saint Georges ! »". Le Moyen Âge. 112 (2): 263–81. doi:10.3917/rma.122.0263.